Home / Articles / AATIP/TTSA / The DoD UFO news is fading. Now what? 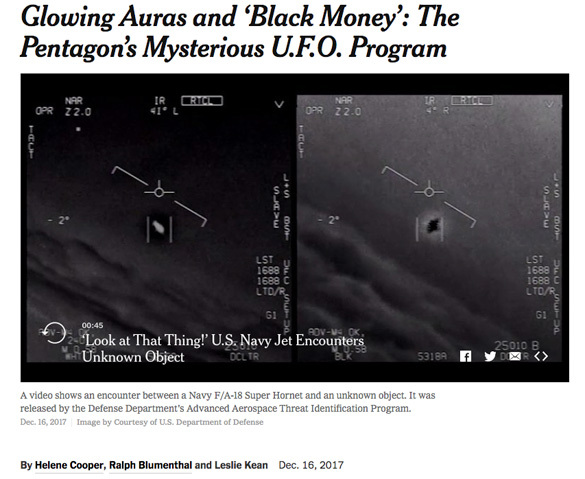 On December 16, 2017, The New York Times posted an article that may have forever changed how the general public views the UFO topic. 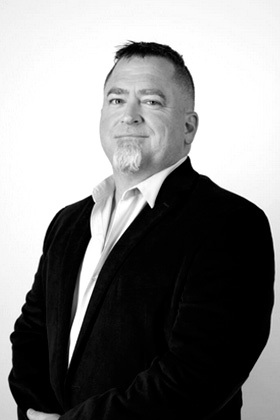 Luis Elizondo, who had previously claimed to work for a UFO project for the DoD, and The New York Times, shared much more detail about the project. The news made worldwide headlines and set off a weeks long media frenzy with interviews with Elizondo, jet fighter pilots who chased UFOs, and retired Nevada Senator Harry Reid, who took the lead on securing funding for the program. However, now that we are almost a month out, the media cycle seems to be coming to an end and the story seems to be fading. But it most likely will not stay that way, because for as many questions that were answered, many more have come to light. For example, Elizondo said he was able to get permission to release three videos of objects they were unable to identify. So far, only two of those have been released, and even these two warrant further scrutiny. One of the better-known videos was from a case that a few UFO researchers had already been examining. This was a sighting of what has been referred to as a Tic Tac shaped UFO by crewmen in the Nimitz aircraft carrier group. The sighting was in November of 2004 near of San Diego. Robert Powell, a UFO researcher with the Scientific Coalition for Ufology (SCU), has been working with the Navy on a Freedom of Information (FOIA) request he had made on the case. He outlined his research thus far in a previous article on OpenMinds.tv. Investigative documentarian Jeremy Corbell had also been researching this case. Most had heard of the case from a blog post made by one of the pilots who witnessed the event. An alleged video from the event was also leaked. Now it has been confirmed the video is from the Nimitz UFO encounter, but we do not know how that video got out to the public in the first place. This was the focus of another recent OpenMinds.tv article by contributor Andreas Muller from Germany. It is video from an advanced infrared camera on an F-18. Not the kind of thing that normally makes its way to YouTube. Although some detail about this event has made it out to the public, the reports and files on the investigation of this UFO are still under lock and key. Powell has not received any of this, despite his requests. He is hopeful now that it has been revealed AATIP looked into this case more documentation will be released. The second video, referred to as the GIMBAL video, was released with very little information as to its origins or the situation in which it was acquired. According to the To the Stars Academy (TTSA) website, an organization Elizondo now works for, the video “was captured by a US Navy F/A-18 Super Hornet using the Raytheon AN/ASQ-228 Advanced Targeting Forward-Looking Infrared (ATFLIR) pod.” However, the date, time and location are still kept under wraps. No doubt there is a stack of FOIA requests on this one. So why release these videos without supporting documentation, and when will we see the third? We don’t know. This seems to imply Elizondo was able to get the videos released under false pretense. However, I have been told that this statement by The Washington Post is inaccurate, and this is not how the videos got released. Well then, how did he get permission to release them, and what was the rationale behind it? We do not know. There are a host of other questions. What other cases did AATIP look into? Do they have more video? Are these three the best they have? How many cases did they investigate and how many remain unknown? Even more exciting, how many of these objects do they believe exhibit technology much more advanced than what we Americans, or humans for that matter, have? WTF? Were these metals analyzed? If so, by whom and what did they find? If the phenomena that produced these metals are still unexplained, does that imply any analysis done thus far was inconclusive? What sort of properties do these metals have? Are they extraordinary? This is kind of a big deal, but we have no answers, and the media is not even asking these questions…yet. 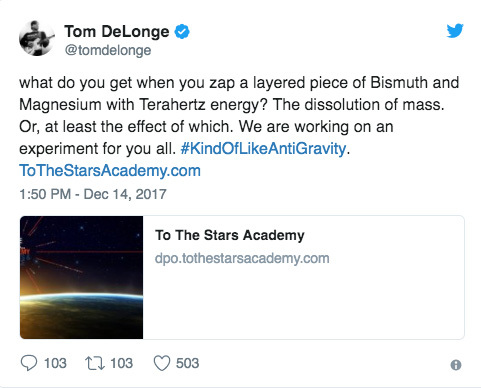 Does this tweet by Tom DeLonge, President and CEO of TTSA, posted two days before The New York Times article, have anything to do with these metals? Physiological changes? Did they find any? The phrase “who said they had” implies this may have been just anecdotal in nature. This brings to mind a recent case where this claim was made in a long and wild story of a man by the name of John Burroughs, who says he came close to a UFO that appeared to land in a forest outside a base in the UK on lease to the United States Air Force. At the time, he was working security at the base and along with others, approached the object. Years later, in a declassified study on UFOs done by the British government, it was speculated that these men might have suffered some physical effects from the object. Burroughs did have health issues he believed stemmed from this incident and had to hire a lawyer to get veterans benefits. Incidentally, Burroughs’ efforts lead him to discover the section in the classified UK report that referred to his encounter and other yet to be released UK UFO files despite the fact that the UK had claimed to had released all of their UFO files. For his research, John Burroughs was awarded the UFO researcher of the year award at the 2015 International UFO Congress. DeLonge won that very award in 2017, and his video acceptance went viral early last year. You can read more about Burroughs’ efforts here. It feels like we learned a lot in the last few weeks. 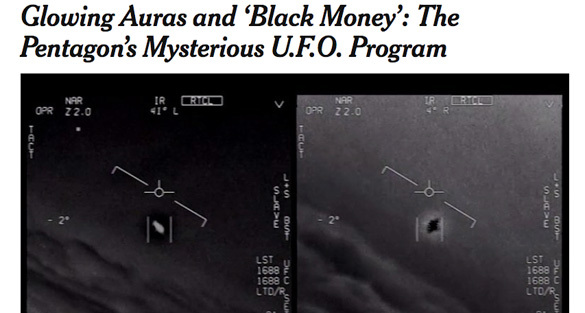 The media seems to have boiled it all down to the idea that the government has taken UFOs seriously and perhaps it is a more credible topic than previously thought. That is a good takeaway. However, there are many more questions that need to be answered, and it is likely more revelation will be forthcoming. I would venture to guess some of those revelations will be coming very soon. Do you have some questions I did not include here? If so, let us know what they are below. Ezekiel 1 arguably describes a super-cooled craft featuring four helicopter pods each with associated but unattached gyroscopic wheels with a central structure that includes a covering firmament or dome that looked like ice. The craft makes noise like a mounted host and moves from place to place like lightening. Someone needs to write a story comparing this craft to the craft divulged by AATIP. Good article. Wasn’t aware of the Delonge post the day before. UFOs have been with us at least since WWII, probably longer. They represent the boundary of our knowledge: not only what we can know, but what we cannot. We need to quit making fun of the subject, that’s just our inflated self-esteem talking, and start taking it seriously. We have a phenomenon here, whatever its origins, that comes and goes as it pleases, despite our best efforts to defend our air space, and treats human beings like lab rats. That alone should concern our military. Meanwhile, we have comparable intelligences here on Earth, like dolphins and whales, that we are only just beginning to appreciate. The obvious outcome of success here will be that we quit thinking of ourselves as “the crown of creation” and begin to see our proper place in the scheme of things. If they do indeed possess material from these objects, then that really raises the bar in terms of proving the existence of UFO’s and their exotic/alien origin, even more than the most sophisticated radar images. I would say that now that they have acquired this material the question is how exactly did they gain possession of it? Considering the defence implications and the DOD’s involvement, remembering the word ‘Threat’ is used within the AATIP heading, that they have shot at UFO’s historically (The Battle for Los Angeles comes to mind), did they then shoot at these UAP’s? As a side note some researchers including myself have considered that SDI (‘Star Wars’), was indeed just that set up to defend against UFO’s that enter our air space even outer space, and it is perhaps possible that this release of information is a means to gradually acclimatise the public to the hostile stance the US government has had with this phenomenon. Remember the Princeton was actively monitoring/tracking fleets of these objects over a long enough time period to have made firing missiles at them an option at the very least. If they did shoot, well then that leads to broader implications, the question then arises that where does that leave us in terms of where we now stand in relation to the intelligence behind these seemingly intelligently controlled craft. The interest hasn’t abated even with fewer news articles. To the Stars has been posting and collating press on this, and the hope is they will be one of many sites that will continue reporting on this with more frequency. I’d like more info on this exciting news and on those alloys. The To The Stars launch video mentioned a plethora of discoveries to look forward to. It is frustrating that debunkers waving books to sell have stampeded to offer their uniformed two cents the media, but it’s been wonderful to follow this news story. Even if people aren’t talking about it over the water cooler they are avidly following this story online. The worm turns. from your own site! One of the big questions you are missing is the fate of the 38 reports and over 3 dozen technical reports produced during the course of the AATIP program. Where are they and when will they be released? The other matter that nobody is touching on is that there appears to be a very powerful group within the IC who do not consider UAP’s to be UFO’s but IFO’s. Incredibly they believe these craft to be flying demons and their study sacrilegious. It’s amazing that this group was able to prevail back in 2012 and close the AATIP program not because of a lack of merit but because of their deeply held belief that the program conflicted with their religious convictions. They need to be ferreted out and exposed. DeLonge’s magnesium/bismuth terahertz experiment? Place your bets. I bet 100 Quatloos that the results will be negative or ambiguous regarding any changes in mass of the substance. There has been plenty of time (years) to try this experiment. The world is not holding its breath on the next New York Times “disclosure” article. The Nixon/Watergate and Monica Lewinsky scandals did NOT come out Drip, Drip, Drip. My humble thanks to Mr. Rojas and the Open Minds group for your persistent work in the field of U.F,O.-ology. I, too, was flummoxed when the news of this inexplicable change in attitude amongst our government at this point in time. I certainly welcome it, but I can’t help but wonder just why this has been allowed to happen when it did. I mean, it’s not like this couldn’t have occurred at least a decade ago, as the stated incidents with the accompanying video was produced and analyzed some years ago. If and when there comes a time when the actual nature and origin of these ‘crafts’ and who are those who built them are revealed – if it is done truthfully, or if this can be done truthfully (-I have some doubts about this. ), what may be discovered could well be more surprising to all concerned. I recall reading of a sighting that was dated between 1913 to 1919, and was included in a book written by Jacque Vallee. The person who related this sighting was. at the time, a young man not yet eighteen, working a lumbar truck driver out on the west coast. He said that he was going down a narrow gravel road with a big load of lumber on his straining truck and he was quite involved in trying to keep his truck and it’s cargo from leaving the road. He said that as he rolled along, he saw an aerial object move out from behind some timber, and he described it as an oval or elliptical object that seemed to be constructed of metal plates with visible rivets in the plated. The object was a drab or olive green color, and he also saw that there was a window on the forward portion of it, and that just before this object went on to move behind a nearby hill. the driver said that he saw what appeared to be a man with dark hair and a tan complexion, describing this person a having “Roman” facial features. But then again, the driver had his hands full just getting his load down the mountain, so how much credence can anyone place on this report? But this report got my attention, and it made me begin to consider that maybe the origin of these aerial objects may at least in part be terrestrial, but then it was early in the twentieth century. Anyway, thanks again for all that you all have done, and try to keep up your good work! Joel Wesley Small, United States Army, Retired. I absolutely agree with Andrzej, that the most powerful group fighting UFO disclosure in the US are evangelicals. Over here in Europe those people are on the fringes of society, but not so in America. They’re reading their KJ bible, completely ignoring the warped, difficult and non-linear transmission of Christian texts in the first say 150 years after they had been composed. Thera are traces of UFO’s in apocryhical texts, but the early church has done everything to suppress that evidence. Some apocryphical texts held as spurious by scholars have evidence of UFO’s. And contary to scholarly belief, not all of them are late composition or fakes, in my opinion they are remnants of older texts that the church has suppressed. I guess there are important codices tucked away in the Vatican’s secret archives that would be explosive, if released. Of course, there have been some attempts to debunk the released videos, specifically by an ex-military pilot questioning the audio tracks, saying that no fighter jock would say “dude” or “bro” as was heard on the audio. The thought came to mind that this is yet another disinformation campaign to draw out “believers” and hammer them yet again after exposing it as a hoax. Whatever the reality, I too was intrigued by the story that religious fundamentalists in the Pentagon were warning against paying any attention to UFOs out of fear that they are demonic entities, and engaging with them risks giving them more power in our world. At least since Reagan, the ranks of the military brass have become ever more Christian fundamentalist and apocalyptic in their thinking. Terrifying. Some of these questions were answered during an exclusive interview Harry Reid gave to reporter George Knapp of KLAS-TV (Las Vegas). Three segments of the interview can be seen or read at their website. I don’t think there’s anything wrong with someone taking out back page advertising in the major newspapers and touting some of the good encounters, FOIAs, and great books out there by Hastings, Dolan, Friedman, Pope, and so on. Why do you have to hush up just because the videos are not being shown? Why not buy up late night infomercial time and sell some “truth” too. Why not put in magazine ads in “normal” magazines. Promote podcasts and these great investigators in your postings around the web. This whole subject needs a marketing team, a plan: get out there and push this! Why do you have to wait anymore? You got an all-star scientific A-team at To the Stars that admitted there’s something to it. It’s time to educate and teach people. The bully tactics of the debunkers insulting people and scaring them from learning about this subject needs to be called out so the mass media stops going to “them” for the answer. If you don’t speak up, you lose public opinion. Let’s get going, maybe it’s grass roots, maybe it’s a couple wealthy donors…let’s get the ball down the field and score some points with the momentum and star players we have! Thank you for your strong reporting, Alejandro. All of us in the movement need to keep asking the tough questions & follow through on all leads to keep the story moving forward. So far we have only been fed a few tiny crumbs from the gigantic loaf of data which we know exists behind the veils. But the conversation has moved forward a tad, and the awareness among the masses is rising; all good. Let us keep the conversation moving forward at the IUFOC!! The two videos don’t show anything special, just camera artifacts. The “Gimbal” video shows glint from an aircraft engine. The glint rotates when the camera rotates due to gimbal lock when it points forward. That’s why it’s called Gimbal. The Flir1 Nimitz video shows some aircraft being tracked as it flies to the left. When the field of view is switched, the track is lost, and the aircraft flies off the screen to the left because it’s no longer being tracked. This sounds to me like a “limited hangout” in which a tidbit of info is released for a specific purpose. I’d guess this is “official cover” to protect the government from its stonewalling the UFO topic for decades. Now, as more information sees the light of day, the Fedgov can point to this to say “sure we investigated it”, instead of “we debunked the topic and anyone reporting it, fired people, ruined careers (many pilots and military)”, etc. Cant help but wonder, at this time of nuclear confrontation with north korea, if kim jong un might be a UFO enthusiast and that a disinformation project is underway to convince him the U.S. has advanced alien weaponry that he should be more afraid of than our conventional nuclear capabilities, which seem quite dated and not made to be used? If this is the case, it will be the final death of news gathering for public service and the whole sale discrediting of the nytimes. I would love for this story to be verified as contact with ET life, but all our public institutions seem inherently untrustworthy.